A pair of brand new sprayers from Miller offer operator comfort and visibility and a host of options. Miller St. Nazianz has introduced the new Miller Nitro 5000 and Condor GS Series sprayers. The machines are offshoots of the company's popular Nitro 4000 and Condor GC machines, and include a host of upgrades for better field flexibility and operator visibility and comfort. Both machines share a newly-engineered cab that is larger, features ergonomic controls and design, and provides better visibility than previous models. New is an enhanced standard lighting system and an optional brighter, more powerful light package. The Condor GC Series sprayer features a new front access ladder and comes in two models of varying power and tank capacity. The Nitro 5000 is available in a wide range of tank capacities, boom widths and horsepower configurations, with optional Miller Quick-Attach and Injection Toolbar, in a total of 7 models -- all available with four-wheel steering option. The Nitro 5345 and 5400 will come on line Jan. 1, 2013, and will be powered with Tier 4a engines from Cummins. New for 2013, Condor GC Series features a new front-access ladder for operator convenience and to keep the operator from ever being under the booms. Two new models, the GC40 and GC75 come in a variety of tank sizes, boom configurations and engine horsepower. Both models are available in a dry box applicator form, with a New Leader G4 255-cu/ft dry spreader. For more information click on www.millerstn.com. 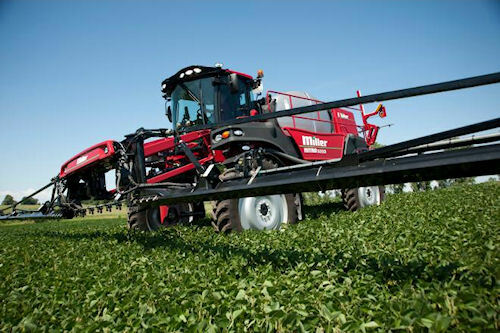 The new Nitro 5000 from Miller St. Nazianz, Inc., shares a newly engineered cab with its sister new sprayer Condor GC Series and will be on display at the Farm Progress Show, August 28-30.